Don’t Let The Bed ... Or Is That A Bat Bug … Bite? Several insects are commonly mistaken for bed bugs and knowing the difference is essential. Bat bugs, similar in name and description, are among the top insects often mistaken for bed bugs. Belonging to the same scientific family (Cimicidae) as bed bugs, they too feed exclusively on the blood of mammals, primarily bats. Studies suggest that bed bugs may have originated from bat bugs when humans once shared caves with bats. The differences between the two are subtle and more often than not, only a trained pest management professional would be able to tell the difference. Both look almost identical in body shape and color, but the key difference is the bat bug’s hair length is longer on the upper covering of their thorax. It is very difficult to see this without the use of a microscope, so it is highly recommended that a trained professional makes the determination between bugs. Another key difference of bat bugs and bed bugs is their location. Most bed bugs can be found within a few feet of their feeding host, which includes mattresses, headboards, baseboards, and other furniture close by. Bat bugs may be seen in a few of these places as well, but are mainly found in areas that harbor bats, such as attics. They may be seen up on ceilings and on the walls, but usually stay within the vicinity of their food source. Bat bugs are easier to eradicate from a home than bed bugs. Once bats have been removed from the home, a pest control technician will take the necessary steps to eliminate the bugs from the dwelling. Carpet beetles are another common pest of homes, often mistaken for bed bugs. One of the biggest reasons they are confused with bed bugs is that they will often be found in the same places that bed bugs are found (around beds and upholstered furniture). Although carpet beetles can be a nuisance within a home, their source of food is made up of a wide variety of fibrous materials (i.e. fabrics, feathers, fur, processed cereal grains, pet food, etc. 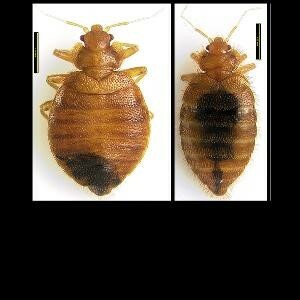 ), whereas a bed bug’s sole source of food is blood. Adult carpet beetles can also fly as opposed to bed bugs which are wingless. Cockroach nymphs (Immature cockroaches) can also appear to be the same color as bed bugs in addition to being nocturnal. They seem to hide in cracks and crevices as well as staying close to food. Although they appear similar in coloration to bed bugs when they are nymphs, as adults they look very different from one another. Another pest that can be mistaken for a bed bug is a tick. Although both are flat, wingless insects that feed off of blood, that’s about where the similarities end. 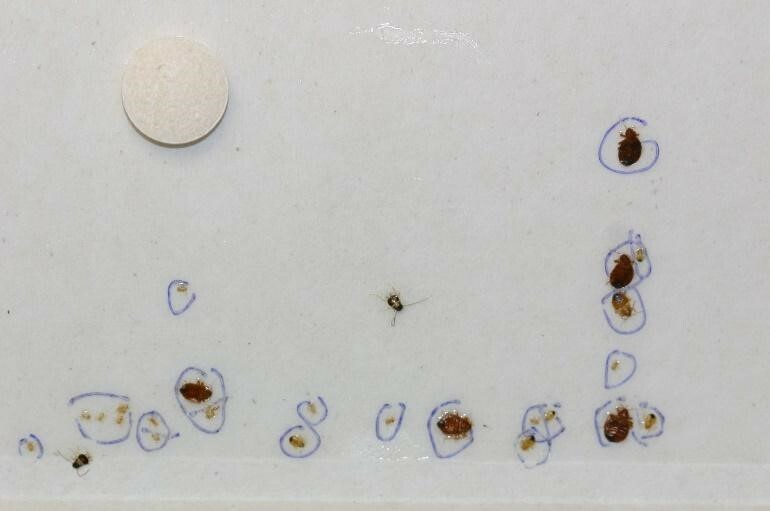 Ticks mainly come from outdoors as opposed to bed bugs that stay indoors. Bed bugs feed on humans for a few minutes (usually while we are asleep) and then return to their secretive hiding places, while ticks will latch onto one spot, embedding their mouthparts into your skin for days until they are completely gorged. Another major difference between the two is the fact that bed bugs transmit diseases when they feed on humans; ticks, however, can spread serious diseases including Lyme disease. If you’re concerned your NJ, or PA home may have bed bugs or any other pest, Cooper Pest Solutions can help. One of our experts will correctly identify which pest you have and provide you with an action plan to eradicate it from your home, providing you with peace of mind. If we determine that you have bed bugs, our “NO PREP” service will ensure that you will not have to spend hours packing up your belongings and emptying out closets and drawers. All of our services are completely guaranteed and minimize the use of pesticides wherever possible.